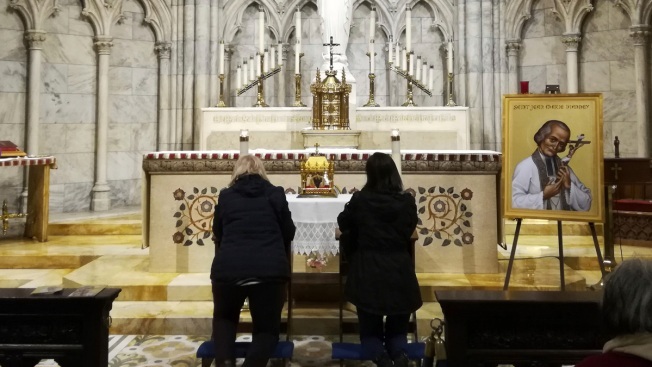 Two women pray in front of a container bearing the heart of St. John Vianney Saturday, April 6, 2019, at St. Patrick's Cathedral in New York. The 150-year-old heart of the French priest is being toured throughout the United States. The tradition of venerating the body parts of saintly Catholics goes back to the Middle Ages in Italy. The 150-year-old heart of a French priest is on a U.S. tour — a Roman Catholic relic with New York City as its latest stop. It was on display Saturday at St. Patrick's Cathedral on Fifth Avenue, where both the faithful and the curious lined up to see the human organ behind glass. The Knights of Columbus fraternity is sponsoring the pilgrimage of this heart, which has been to 28 states so far, with more coming up. The tradition of worshipping the body parts of saintly Catholics goes back to the Middle Ages in Italy. When St. Catherine of Siena died in Rome, her hometown of Siena wanted her remains. But they didn't want to get caught making off with the whole body, and decided to take just her head. "He would also recount to them the sins they left out, because he instinctively felt who they are," says Joseph Cullen, a member of the Knights of Columbus. "But he had a heart of gold." In the next week, Vianney's heart will be displayed in schools and churches in other parts of New York City — Staten Island, Queens and Brooklyn — and Long Island, as well as other venues on the East Coast. The relic is to return to its permanent home at a French shrine in Ars in early June. The U.S. tour began in November.